This is a festive appetizer with cream cheese, sour cream, and picante sauce wrapped in flour tortillas. Serve with salsa. Beat cream cheese, sour cream, picante sauce, taco seasoning, and garlic powder together in a small bowl until smooth. Stir olives, chilies, and Cheddar cheese into the cream cheese mixture. Spread about 1/2 cup of cream cheese mixture onto each tortilla. 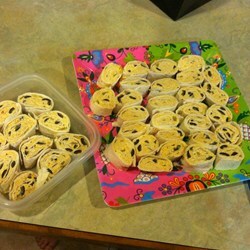 Roll each tortilla like a jelly roll; wrap in plastic wrap. Refrigerate for 2 hours to overnight. Cut into 1-inch slices.